Will Walgreens and other corporations that formerly backed ObamaCare now reform their ways and help President Trump with his health care reform initiatives? One J.D. discussed it with another J.D. 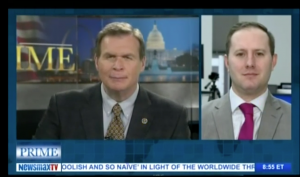 on “Newsmax Prime” on January 27, 2017, as former Rep. J.D. Hayworth interviewed Justin Danhof, director of the Free Enterprise Project at the National Center for Public Policy Research. Danhof’s appearance can be seen in full below.